KMS produces a 316 Stainless, Single Row, Deep Groove bearing fitted with a polymer cage and Ceramic Balls. It is specifically designed to provide superior corrosion resistance when compared to conventional type 440C stainless or steel bearings. 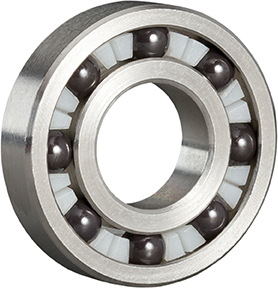 Ceramic Balls offers a reduced friction bearing that can run without lubrication in slow to moderate speeds and loads.